While last season’s fourth-place finish in the Atlantic Division isn’t much to write home about, New York Knicks fans have plenty to be excited about this season – the team hired coach David Fizdale and added a bevy of players with potential. Because of that, demand for tickets has risen 2% over last season. 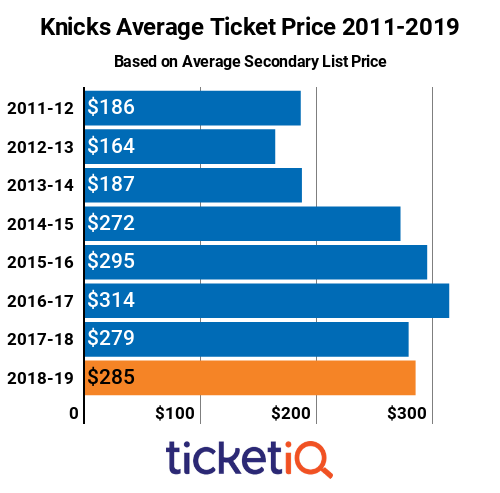 Below is how 2018-19 New York Knicks tickets stack up on the secondary market and across the league. Prices are the third highest since 2011, when TicketIQ.com began tracking data. The highest price was $314 in 2016-17, after the Knicks finished third in the Atlantic Division. 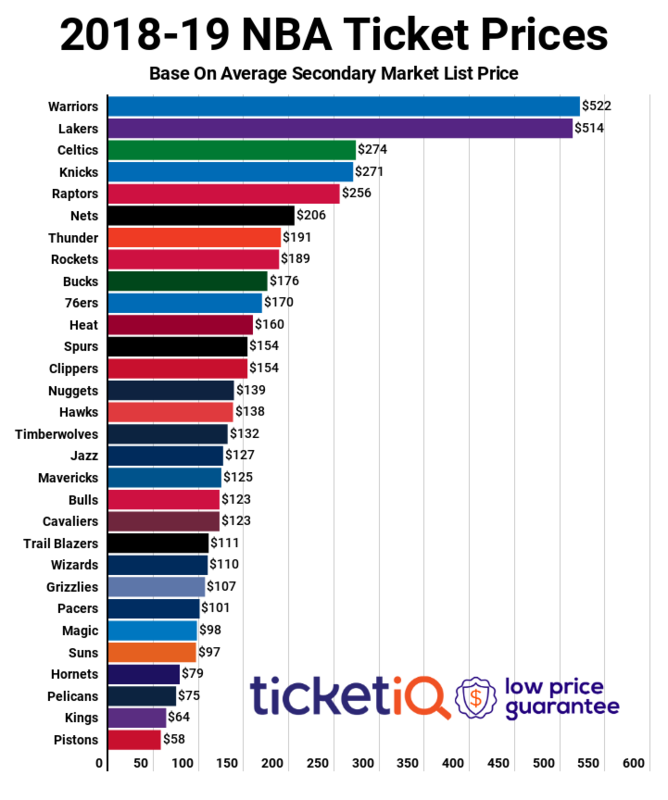 With a $285 average asking price, Knicks tickets are ranked No. 3 in terms of price across the NBA, the same rank as the previous season. Only the Golden State Warriors, with a $463 average, and the L.A. Lakers with a $444 average are more expensive. Season tickets are available through the Knicks website, and fans that buy a full- or half-season package by October 12 get a free Kristaps Porzingis shirt. Single-game tickets are available for most games through the Knicks’ primary ticket partner, Ticketmaster. The Knicks open at Madison Square Garden on October 17 vs. Atlanta, and TicketIQ.com has seats available all over the arena, including in Section 200 Level 201 high above the action starting at $118 or in Row 4 of Section Floor 05 across from the team benches for $960. 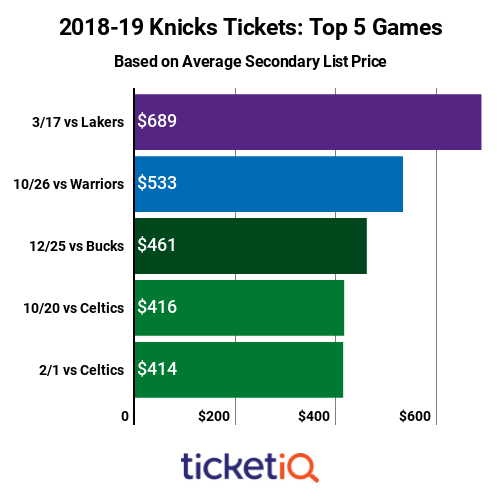 Knicks fans can’t wait to see LeBron James in an L.A. Lakers uniform and have driven secondary market prices up to $689 for the March 17 game. The Knicks and Lakers already had a storied history, so adding James to mix has only made the matchup that much more interesting. The next most expensive game, at $533, is October 26 when the defending NBA champion Golden State Warriors visit Madison Square Garden. The next three priciest games are $461 for the Christmas Day Milwaukee Bucks game; $416 for the October 20 Boston Celtics game and $414 for the February 1 Boston Celtics game. TicketIQ.com has seats for all games, including many with the company’s Low Price Guarantee. For the Lakers game, TicketIQ.com has 200-Level seats high above the action starting at $244 or floor seats behind the net in Row 13 for $562.